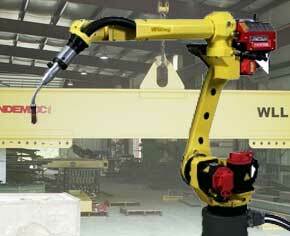 Tandemloc provides metal inert gas (MIG) welding utilizing both expert manual and hi-tech robotic welding services. AWS D14.1-certified welders perform all of our manual welding operations. Welding operations can be carried out on a wide range of materials including stainless steel and aluminum in an assortment of sizes ranging from ¼-inch bars to 50-foot frames. The robotic welding equipment we utilize allows us to rapidly perform accurate welds, making it ideal for repetitive welding tasks. The welding operations we perform are tested using a number of techniques, including acid etching, magnetic particle inspection, and hydrostatic inspection to ensure quality. Deburring, bar coding, and custom packaging are some of the secondary services that are offered in support of our welding capability.